To reach the Canaan Cemetery from Florence, Alabama, travel Alabama Hwy. 20 west for 3.3 miles. Turn left (west) onto County Rd. 14 (Waterloo Rd.) and go 10.2 miles. Turn left (south) onto County Rd. 189 and go 2.8 miles. The church and cemetery are at the corner of County Rd. 189 and County Rd. 62. The cemetery lies behind the church. The Canaan Methodist Church was organized in 1844. This survey begins with the four graves immediately behind the church where the fence corners. Row 2 begins at the northwest end and each row alternates north and south directions. 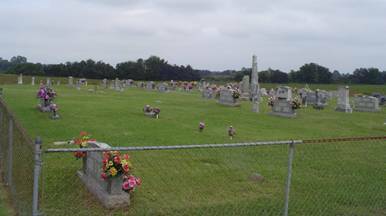 Some of the older graves are misaligned and are recorded as closely as possible in the noted lines. Irions, Lizzie C.; b. 05 Feb 1888, d. 20 Jan 1929, wife of Smith H.
Skipworth, Mary Etta; b. 16 Aug 1913, d. 06 Feb 2005, wife of Charles W.
Joiner, Betty Frances; b. 26 Aug 1938, d. 27 Sep 1938, daughter of Robert T. & Mary P.
Joiner, Mary P.; b. 14 Mar 1911, d. 09 Oct 1982, wife of Robert T.
Rogers, Johnnie; b. 15 Apr 1913, d. 08 Mar 1941, son of J.W. & G.T. Rogers, Jaunita; b. 12 Nov 1920, d. 05 Apr 1924, daughter of J.W. & G.T. Irions, Bertha Marie; b. 14 Sep 1910, d. 11 Jun 1919, daughter of S.H. & L.C. Irions, George Clifford; b. 24 Apr 1909, d. 25 Oct 1919, son of S.H. & L.C. Irions, Elizabeth Broadfoot; b. 19 Apr 1920, d. 22 Jul 1921, daughter of S.H. & L.C. Irions, infant; born & died 03 Sep 1923, infant of S.H. & L.C. Irions, infant; b. 03 Sep 1923, d. 10 Sep 1923, infant of S.H. & L.C. Jones, Mattie E. (Koger); b. 09 Dec 1907, d. 15 Jun 1939, wife of Arnold E.
Jones, Jimmie Sue; 11 Jun 1939, only date, daughter of Mattie E.
McKelvey, Clyde S.; b. 16 Sep 1901, d. 19 Nov 1902, son of G.A. & E.H.
Hale, James Early; b. 24 Mar 1895, d. 11 Nov 1926, son of W.W. & L.A.
Hale, Andrew Guy; b. 25 Jan 1892, d. 18 Oct 1906, son of W.W. & L.A.
Summerhill, Houston; born & died 06 May 1899, infant of J.S. & M.J.
Kimbrough, Nora N.; b. 21 Apr 1885, d. 17 Dec 1912, wife of Dee W.
Broadfoot, Katie; b. 31 Mar 1859, d. 14 Oct 1901, wife of William A.
Barker, T.C. ; died at 15 years old, daughter of J.T. & M.L. Barker, J.H. ; 21 days old, son of J.T. & M.L. Barker, H.L. ; b. 23 Jan 1904, d. 23 Feb 1904, son of J.T. & M.L. Parish, Floid; b. 09 Feb 1898, d. 27 Jul 1898, infant son of J.I. & Minnie D.
Hale, Dorcas Catherine; b. 19 Sep 1848, d. 03 Sep 1897, wife of G.A. Darby, infant; 1918, only date, daughter of Etta P. & Henry R.
Darby, Etta P.; b. 11 May 1891, d. 13 Dec 1977, wife of Henry R.
Irons, baby; no dates, infant of Arnold R. & Nancy M.
Irons, Etta May; b. 12 Aug 1916, d. 04 Nov 1916, infant of Arnold R. & Nancy M.
Till, Mollie Francis; b. 30 Oct 1856, d. 13 May 1927, wife of Edwin R.
Phillips, Martha F.; b. 18 May 1854, d. 17 May 1936, wife of D.F. Phillips, Robert M.; b. 13 Jan 1887, d. 30 Dec 1901, son of D.F. & Martha F.
Rice, Early H.; b. 20 Feb 1890, d. 04 Sep 1892, son of W.P. & J.F. Rice, Susan; b. 01 Feb 1829, d. 10 Sep 1900, wife of J.P.
Howard, Pauline R.; b. 06 Jul 1918, d. 11 Feb 2011, wife of Millard F.
Phillips, Thomas E.; b. 1917, d. 1940, son of J.W. & Mary E.
Johns, Angela Leah; b. 27 Oct 1965, d. 10 Jul 2010, wife of Thomas DeWitt Jr.
Fulmer, Hardy Mc; b. 28 Mar 1919, d. 12 Jan 1921, son of J.A. & O.E. Irions, Arnold F.; b. 05 Jan 1907, d. 08 Dec 1909, son of J.O. & Dora B.
Irions, Bessie May; b. 24 Nov 1911, d. 18 Sep 1912, daughter of J.O. & Dora B.
Irions, Dora Belle; b. 04 Oct 1886, d. 19 Oct 1961, wife of John O. Irons, Alta Mae; b. 03 Nov 1921, d. 27 Feb 2007, wife of C.S. Rice, infant; b. 18 Aug 1940, only date, son of James E. & Lucille P.
Irons, Gertrude; b. 20 Mar 1922, d. 15 Feb 1928, daughter of G.C. & M.L. Broadfoot, Pauline R.; b. 29 Sep 1921, d. 07 Oct 1992, wife of William E.
Halliman, Percy Melvin; (surname differs) b. 30 Sep 1914, d. 27 Jul 1919, son of J.V. & L.K. Holliman, Mary Louise; b. 22 Oct 1916, d. 14 Apr 1918, daughter of J.V. & L.K. Neal, Andrew Grady; b. 15 May 1938, d. 10 Jan 1956, son of Elmer L. & Flora I. Irons, Maud L.; b. 13 Jan 1894, d. 20 Aug 1967, wife of George C.
Brewer, Elizabeth S.; b. 15 Sep 1914, d. 27 May 1995, wife of Laymon L. Sr. Brewer, infant; b. 21 Feb 1951, d. 21 Feb 1951, daughter of Laymon L. Sr. & Elizabeth S.
Wright, Harriett; b. 07 Mar 1867, d. 08 Jul 1902, wife of B.F.
Wright, Ola Mae; b. 05 Jul 1902, d. 26 Jul 1902, daughter of B.F. & Y.B. Hamm, N.M.; b. 03 Feb 1849, d. 17 Mar 1913, wife of T.B. Danley, Eva; b. 15 Jan 1905, d. 01 Aug 1913, daughter of C.B. & E.W. Brewer, Virgie Mae; b. 23 Apr 1923, d. 10 Jan 2013, wife of Jeff D.
Gann, E.S. “Jean”; b. 21 Sep 1938, only date, wife of R.D. Gooch, Macil Betherine; b. 25 Mar 1929, d. 23 Jul 2014, wife of Ralph R.